Robust delights await in this historic, off-the-beaten path region of France. A hilly, pastoral region in southwestern France, Gascony was long known as the home of D’Artagnan, Alexandre Dumas’s swashbuckling protagonist in The Three Musketeers. While other regions of France have attracted exponentially increasing numbers of tourists over the years, balmy, bucolic Gascony has remained largely unspoiled. But discerning food lovers always celebrated the region’s food—a robust, straightforward cuisine that for generations has featured the bounty of the garden, barnyard and the surrounding woodlands and waterways. Duck, goose and pork play a prominent role in the local fare; the fat of all three is used as a flavoring and cooking medium. Fat finds another purpose in the region’s famed confit of duck and goose as a preserving medium. And the livers of the two birds are served up as foie gras or in pâtés. Seasonal fruits and vegetables find their way to the table in all kinds of dishes, from soups to salads to hearty stews like the famed cassoulet, a slow-cooked mélange of beans, vegetables, duck or goose confit, sausages and other meats. Local hams, particularly jambon de Bayonne, are prized, as are game and game birds; and seafood from the Atlantic (to the west), the Garonne River (to the east) and various waterways in between. Wild mushrooms add their influence as do fresh herbs and aromatics like leeks, shallots, onions and garlic. One outsider who illuminated these oft-hidden culinary treasures was cookbook author and “culinary anthropologist” Paula Wolfert, who recognized the symbiotic relationship between the wines, brandies, cuisine, environment and slow-paced lifestyle of France’s southwest while traveling through Gascony in the late 1970s. Through her landmark book, The Cooking of Southwest France, first published in 1983 and reissued in 2005 (John Wiley & Sons, $37.50), San Francisco-based Wolfert introduced a captivated culinary world to “a magnificent peasant cookery” that she described as “modern, honest, yet still close to the earth.” By the mid-1980s, French restaurants across North America began incorporating the cuisine into their repertoires. In the 1990s, Gascon cuisine was epitomized in the U.S. by Ariane Daguin’s D’Artagnan, a wholesaler of foie gras and other food products of Gascony that developed a client base of fine restaurants and retailers all over the nation. The daughter of iconic Gascon chef André Daguin, she was for several years the owner of D’Artagnan Restaurant and Rotisserie in New York City. Daguin supports all things Gascon, not just the customary foods, but likewise Armagnac and les vins de Gascogne; her company’s role in bringing items like duck prosciutto, sliced smoked duck breast, and shavings of duck foie gras to U.S. menus is immeasurable. Foie gras with sesame seeds pairs beautifully with a well-chilled Tariquet Sauvignon Blanc. Recent advances in the public profile of Armagnac, Gascony’s fabled pedal-to-the-metal grape-based brandy, has furthered the cause of Gascony even more. 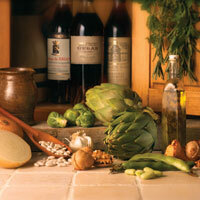 Gascon chefs as a matter of routine use Armagnac to marinate meats and fowl. They contend that the potent winey/woody flavors of Armagnac lend a slight sweetness to pork shoulder, capon or pigeon. Some associate the food of Gascony with excessive fat, due to its signature use of duck, goose and pork fat and its rich foie gras. In truth, the region enjoys many foods that are not high in fat and calories. Gascons themselves, like so many of the southern European counterparts, consume small portions, lead active outdoor lives, drink moderate amounts of wine and spirits daily, and, consequently, are remarkably slender and healthy. Paradoxically, Gascony gave the world one of its premier “light” diets: cuisine minceur, which was pioneered by Chef Michel Guérard, the proprietor of the Hotel Les Pres d’Eugenie spa in Eugenie les Bains. Les Pres d’Eugenie is home to Les Tables de Michel Guérard, a recipient of three Michelin stars that serves its patrons light, yet delicious, low-calorie cooking that relies on Gascony’s freshest locally grown produce, meats, dairy, brandies and wines. Another advocate of Gascony cooking is Kate Hill (see sidebar), the American entrepreneur, author and cooking teacher whose French Kitchen Arts cooking school is located in the hamlet of Camont near Agen. Hill, who began her Gascon odyssey as the captain of a barge that offered culinary tours through the region, now perpetuates cuisine Gascon through the cooking classes she conducts in her 18th century kitchen. The author of A Culinary Journey in Gascony (Ten Speed Press, reissued 2004, $18) believes that since Gascony is one of France’s most diverse agricultural districts, to truly get to know it, you must spend time there. Whether you dine on Gascon fare at home or on-site in France, the question arises: which wine to pair with this rustic cuisine? The region produces some excellent wines; it has nine appellations d’origine controlee. Hearty, dense family-style Gascon dishes beg for equally big-hearted red wines of substance and character. And for that, you can’t go wrong with the tannic reds of the Madiran district, which lies to the west of the River Adour in Haute-Pyrenées. With a high percentage of the thick-skinned black Tannat grape, and in some cases, lesser amounts of Cabernet Sauvignon, Cabernet Franc or Pinenc, inky, long-lived Madirans provide the ideal foil to Gascony’s farmhouse stews and duck dishes. Foie gras, the other Gascony staple, can be equally compatible with crisp whites from Cotes de Gascogne (Gers) or Jurançon (Haute-Pyrenées), claret style reds from Buzet (Lot-et-Garonne) or sweet whites from Monbazillac (Dordogne). The key to the selection depends largely on how the foie gras is prepared and served. As an appetizer, it works beautifully with either a stone-dry Sauvignon Blanc or with a sweet, ripe nectarine-like Monbazillac. Seared with berry sauce as a main course, foie gras buddies up well with an aromatic, medium-bodied red from the Buzet appellation. Buzet’s reds are made from Cabernet Sauvignon and Franc, Merlot and Malbec, the same grapes as Bordeaux to the north; many fans consider Buzet’s bottlings similar to the far more expensive wines of its neighbor. On its own, or as a closing course, it makes lovely music with the sweet white wines of Jurançon. These are made from Courbu, Gros Manseng and Petite Manseng grapes; the sweetness comes into play when they’ve been affected by Botrytis Cinerea. Gascony is better known for Armagnac, which was first produced for medicinal purposes in the 14th century. It is grown in three appellations, Bas-Armagnac (which produces a delicate, fruity brandy); Tenareze; and Haut-Armagnac. Most Armagnacs are at their peak between 18 and 30 years of age. An inventive way to enjoy Armagnac is as an in-between course pleasure, pouring about one-quarter to one-half ounce per person. It’s of crucial importance to keep the palate-cleansing Armagnac helpings small, so as not to take away from the next course or the wine. And served after dessert, as the conclusion of a multi-course meal, Armagnac has no peer. To drive dinner guests into euphoria, assemble the following Gascon dishes for a relaxed weekend feast. It will be an evening that will mirror all that’s wholesome, unique and downright breathtaking about Gascony. This spicy variation makes a luscious fall-to-spring season stew that is best served straight from a cooking dish placed on the table. This dish is not for the faint of heart. You’ll need to start cooking early—the day before your feast, and you must allow several hours of cooking time on the feast day itself. The dried beans should be soaked to soften them before cooking. Use the quick method outlined below, or the night before your first cooking day, place the beans in a bowl, cover with water and soak overnight. Drain and discard the soaking water. The day before your cassoulet feast, remove the duck confit from the refrigerator and let it come to room temperature so that the fat separates easily from the meat. Meanwhile, if you have not soaked your beans overnight already, place them into a large bowl and pour in enough boiling water to cover. Let them soak for at least an hour until they have absorbed the bulk of the water and doubled in size. Drain the beans and discard the soaking water. Set aside. Using a wooden spoon, separate the softened confit duck legs from the fat that surrounds them and spoon the fat into a 4-quart Dutch oven, reserving 2 to 3 tablespoons of the fat for later. Cover and return the duck legs and reserved duck fat to the refrigerator. Then, set the Dutch oven over medium heat, add the olive oil and Spanish onions and sauté, shaking the pan and stirring, for 4 to 5 minutes, or until the onions are soft and translucent. Add the tomatoes and cook, stirring occasionally, until softened. Pour in the chicken stock. Add the cubed pancetta, garlic cloves, carrots, celery and ground black pepper. Bring to a boil, reduce the heat to low and cook for 90 minutes until the vegetables are softened, making a ragout. Add the drained beans. Simmer for 3 to 4 hours. Remove from the heat and let cool. Skim the fat from the surface, cover and refrigerate overnight. The following day, remove the vegetable ragout and duck confit from the refrigerator and let stand for 1 hour. Place the duck confit into the top of a double boiler set over simmering water and heat for 5 minutes. Cool for 10 minutes. Pull the meat off the bone and cut into chunks and strips. Preheat oven to 375°F. Grease a 4-quart casserole dish with the reserved duck fat or olive oil. Transfer the ragout to a baking dish that can double as a serving dish. Add the duck meat, chorizo sausage and morels. Stir to distribute the ingredients. Cover the pan with foil and bake for 1 hour. Remove the cassoulet from the oven and remove the foil cover. Skim any excess fat from the surface. Stir in the parsley. Sprinkle the breadcrumbs over the surface. Reduce the oven temperature to 325°F and return the cassoulet to the oven; bake for 1¼ – 2 hours. A crust will form on top. Remove the cassoulet from the oven, let it stand for 10 minutes, and serve in dinner bowls. Serves 6-8. Palate cleanser: One quarter to 1¼-ounce of cellar temperature Château de Briat 1986 Baron de Pichon-Longueville Bas Armagnac. Wine recommendation: Cellar temperature Château Peyros 2000 Madiran. Armagnac’s pungent taste makes for a delicious poaching liquid and sauce and is an ideal companion for orchard fruit desserts. Combine the water, cinnamon, vanilla, sugar and Armagnac in a 2-quart saucepan and cook over medium-heat until the sugar dissolves. Add the halved pears. Simmer for 15 to 20 minutes, stirring frequently but gently, until the pears are tender. Remove from the heat; carefully transfer the pears and sauce into mixing bowl. Cover and refrigerate for at least 4 hours. When ready to serve, remove the bowl from refrigerator. With a slotted spoon transfer the pear halves to another bowl; remove any stray vanilla bean and cinnamon bits. Strain the remaining liquid over the pears. Spoon the ice cream into individual serving dishes. Distribute the pears between the dishes. Drizzle the sauce over each and garnish with ginger cookies. Serves 6 to 8. Digestif: 1 to 1¼-ounces of cellar temperature Château de Busca 1985 Tenarèze Armagnac. Wine recommendation: A botrytis-affected sweet wine, such as Grande Maison’s 2001 Cuvée Madame from Monbazillac, or Marquis de Montesquiou XO Armagnac.